Introducing the Jimmy Research Humanoid! For the last several months we’ve been working tirelessly on a secret project, and we’re finally ready to share it with the world! Today at the Re/code conference we’ll be unveiling the Jimmy Research Robot. 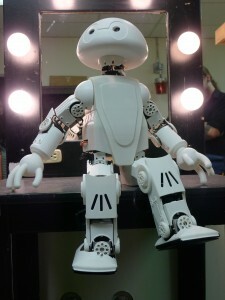 Jimmy is the first robot platform to be released by the 21st Century Robot Project. The 21st Century Robot project is the brainchild of Intel’s Futurist Brian David Johnson and is the result of the collaboration of developers from USC, Olin College, and Trossen Robotics. A Robot Is: Imagined first. Easy to build. Completely open source. Fiercely social. Intentionally iterative. Filled with humanity and dreams. Thinking for her/him/itself. Jimmy’s internal endoskeleton is manufactured from 5052 aircraft aluminum, and is completely modular and expandable. The outer shell of the robot is designed to be 3D printed, which means modifications and aesthetic tweaks are very easy and affordable. The robot features 12 MX-106T, 6 MX-64T, and 2 MX-28T DYNAMIXEL servos from Robotis. The on-board CPU is comprised of an Intel NUC D54250WYK, which features an Intel Core i5-4250U 4th Generation Haswell chipset, 4GB of DDR3 RAM (up to 16gb expansion), and a 32GB SSD for internal storage. Wireless connectivity options are available in Xbee, Wifi 802.11N, and Bluetooth. Onboard IO for expansion and development include 4x USB 3.0 & 2x USB 2.0 ports, HDMI & Display Port video output, Gigabit Ethernet, SATA port, 2x mini-PCIe slots (used for SSD & Wifi/Bluetooth), and up to 8-channel audio. The sub-controller used to communicate with the Dynamixels is the Robotis CM-730 Cortex-M3 based microcontroller, which will eventually be replaced by our own Arbotix-PRO (currently in development, scheduled release is Q4 2014). Onboard LiPo batteries provide 4S 14.8v 4000mAh of power, which produces approximately 30-60 minutes of runtime per charge. The humanoid robot platforms of the 21st Century Robot project aim to run a unified software framework. The robot is offered in two flavors of Linux- Ubuntu 14.04 LTS for developers who wish to take advantage of a full-featured desktop OS, or Yocto Project Poky distribution OpenEmbedded Linux which has a custom 21C Robots layer to allow for unified support across many different CPU configurations and hardware. This framework is being actively developed, and is based upon the open-source and highly featured Darwin-OP framework from Robotis and Virginia Tech University. We will continue to refine and expand this software, providing multiple control interface solutions as well as a REST based API so that the robot can be connected to ROS & the Intel XDK for cross-platform application development, as well as a variety of different software environments. The goal of the API is to easily expose higher level functions of the robots, so that developers can bring the robots to life without having an in-depth knowledge of the more advanced lower level functions that make the robot move and walk. Like the hardware, all of the software will be available completely open-source and available for anyone to download. This entry was posted on Wednesday, May 28th, 2014 at 8:29 am	and is filed under Front Page News. You can follow any responses to this entry through the RSS 2.0 feed. You can leave a response, or trackback from your own site. I am extremely excited to get my hands on Jimmy, Makes me remind of Wall E.
Where can we get the CAD files? I can’t seem to find them. A little confused on the price. I thought I heard $1600 for the kit, but doesn’t Jimmy include about $7000 worth of servos alone? Thanks. CAD files and other files will be available soon. The research level jimmy costs $16,000 – this robot uses MX DYNAMIXEL servos. We are working on a $1,600 version using AX DYNAMIXEL servos – we hope to have that ready by the end of the year. I’ll see what I can do about getting some sneak-peaks out there.